The most useful, professional blow-styling brush ever designed. Winds and unwinds hair end beautifully. Doesn't tangle. Lightweight, extra-long handle. And it's so easy to use. Kind to hair and scalp. 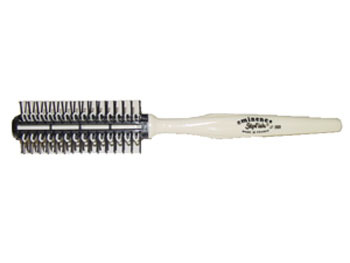 Specially designed loops and ball-tip bristles are gentle to scalp and hair. Ideal for curly, straight, short or long hair. Bristle and ball-tip is molded as one unit. This unique constructions prevents ball-tips from off or coming apart.